Donald Trump set down with the NY Times for a talk…. 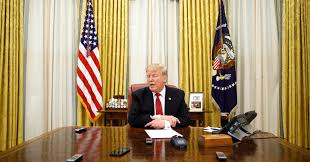 Addressing a wide range of subjects, Mr. Trump brushed off the investigations that have consumed so much of his presidency, saying that his lawyers have been reassured by the departing deputy attorney general, Rod J. Rosenstein, that the president himself was not a target. “He told the attorneys that I’m not a subject, I’m not a target,” Mr. Trump said. But even if that is the case, it remains unknown whether the matter would be referred to the House for possible impeachment hearings….